Perfectly roasted asparagus with a flavorful creamy cilantro-lime sauce. 1. Preheat the oven to 425ºF (218°C). Line a baking sheet with parchment paper or a silicone mat. 2. Wash the asparagus and snap or chop off the bottoms of the stalks. 3. In a large bowl, toss in the olive oil and mix well. 4. 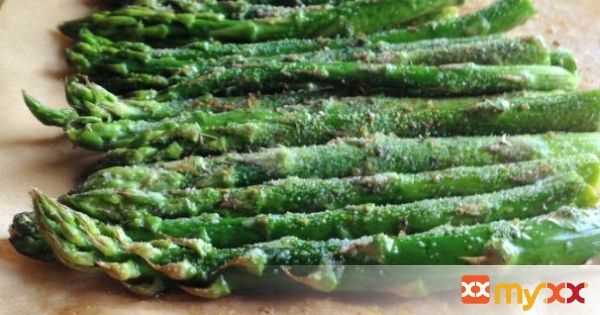 Spread the asparagus on the baking sheet in a single layer and sprinkle garlic powder, oregano, and a tiny bit of salt on the asparagus. 5. Bake for about 8-10 minutes. 6. While the asparagus spears are cooking, prepare the creamy cilantro-lime sauce. 7. Rinse the cilantro and chop off the bottoms. It is fine to leave some of the stem in tact. 8. Add all ingredients into a food processor or blender and mix until well incorporated. 9. Remove the asparagus from the oven once they look tender. When they are slightly cool, drizzle on the creamy cilantro-lime sauce.